Stylish, Ultra-Modern Rack Keeps Your Reading Materials Organized And Easy For The Next Reader To Find In Your Waiting Area, Reception Room Or Employee Break Area. Use The Seven-Pocket Rack To Display Business Forms, Corporate Literature, Industry Magazines Or Other Magazine And Literature Pieces. Heavy-Duty Steel Offers Durability. Wall Rack Includes Mounting Hardware. Each Compartment Measures 9-1/4" Wide X 2" Deep X 4" High.. Stylish, Ultra-Modern Rack Keeps Your Reading Materials Organized And Easy For The Next Reader To Find In Your Waiting Area, Reception Room Or Employee Break Area. 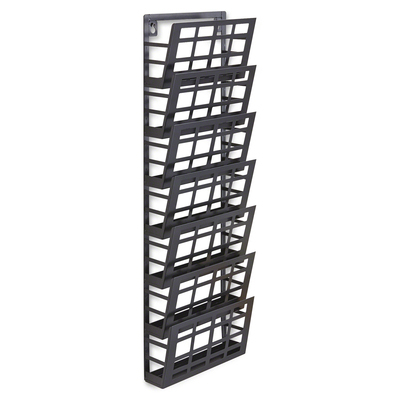 Use The Seven-Pocket Rack To Display Business Forms, Corporate Literature, Industry Magazines Or Other Magazine And Literature Pieces. Heavy-Duty Steel Offers Durability. Wall Rack Includes Mounting Hardware. Each Compartment Measures 9-1/4" Wide X 2" Deep X 4" High.